The party took place on the first official day of the season, September 22, but any fall weekend is the perfect weekend to embrace the season change! First order of business, invite your gal pals and ask them to come dressed in the basic fall girl uniform: sweaters, flannel, leggings, scarves, and boots. Then, help them to complete as many things on the basic fall girl checklist! 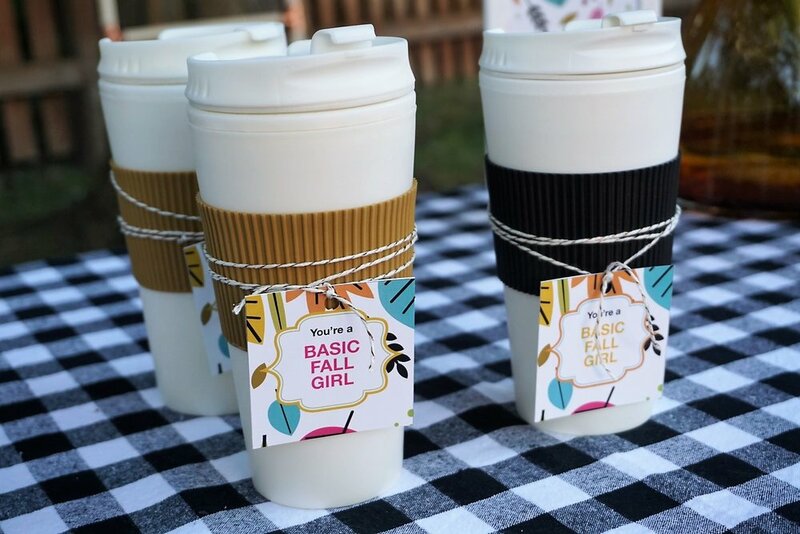 My friend Meghan at Elva M. Design Studio created the perfect set of printables to capture the basic vibe of the party! You'll see them sprinkled throughout the party! Fall is all about bring the cozy and comfort! My maid of honor flew in to take part in the festivities and it was so fun to have her in for the weekend. We spent the day shopping for all of the goodies and cooking away in the kitchen. A good cheese board is always a hit at a girl's night. We used cheddar, mozzarella drizzled with balsamic glaze, and an herb goat cheese. To add some additional fall elements, consider cutting up some figs and apples and add some honey, olives, and nuts. Why stop at a cheese board? Warm baked brie is another favorite of mine as the weather cools down! My friend makes a fabulous baked brie using crescent rolls and fruit jam. Layer your brie and jam of chose (we used raspberry) in crescent rolls and brush on some egg for a nice browned crust! Bake it at 350 degrees for around 20-30 minute when the brie is melted and the top is golden. It can be served with any variety of your favorite crackers or a fresh baked baguette. Fall also brings the best colors of produce. Roasting veggies for a party offers a healthy option to snack on and can be served hot or chilled. Try roasting Trader Joe's tri-colored carrots and some asparagus to bring some color to you menu. Just add olive oil, salt and pepper and roast for 30-45 minutes. I also served up some of the group's favorite appetizers of mine including a taco dip and chicken ragoons. Check out how you can make taco dip look spooky for upcoming Halloween gatherings here. 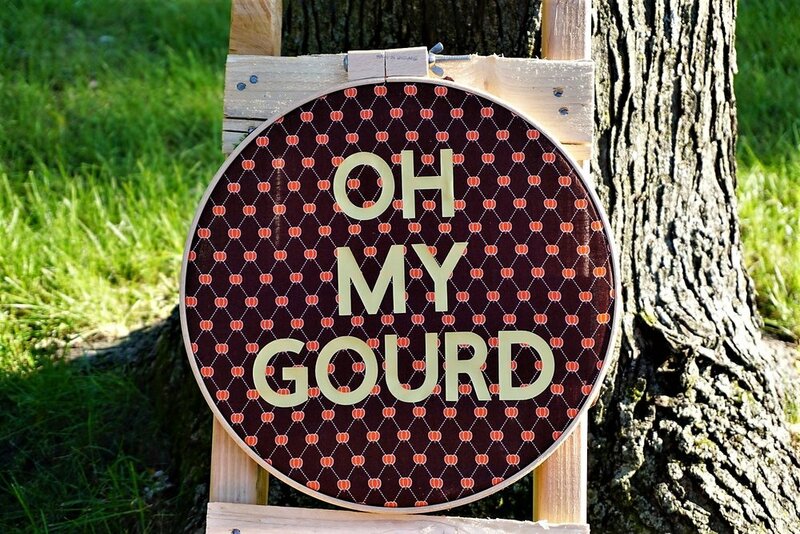 I loved all of the fun signs from Elva M. Design and I was so excited to find the perfect plates to coordinate at Target. I picked up the mustard color napkins at Dollar Tree and found the teal forks at Walmart. Using Fall floral hues always adds warm color to your home or a gathering. I've been trying to get better at incorporating fresh flowers or greens into my events, like my recent Rosé Before the Big Day bridal shower I hosted. Recently, I've been inspired by my friend and fellow blogger, Katie, at It's In the Details. She is an absolute whiz at creative floral ideas and keeps things in my grocery store budget with her suggestions! I had the idea of doing something in an Ugg boot for the party and she came back with design ideas and a list of flowers to consider using. My Trader Joe's had most of what Katie's did, but what they didn't have I was able to sub in quickly with some other beautiful fall floral! I am learning to take chances on mixing things together and that flowers are sturdier than you'd think as you start arranging! Be sure to check out Katie's tutorial on how to make your own Ugg floral arrangement on her blog! The extra flowers were perfect to sprinkle throughout the party in jewel tone vases that I picked up at Goodwill. I snagged six different sizes and shapes for $10 total! What a steal. 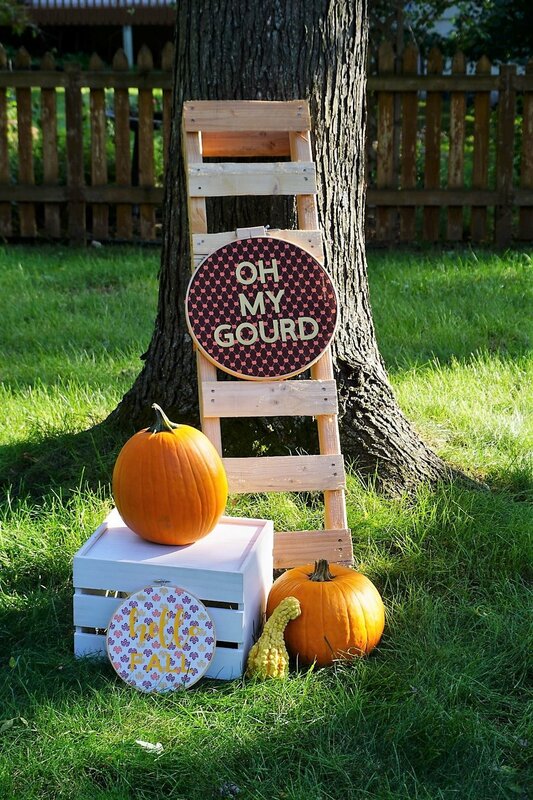 It's also easy to add in pumpkins and gourds. 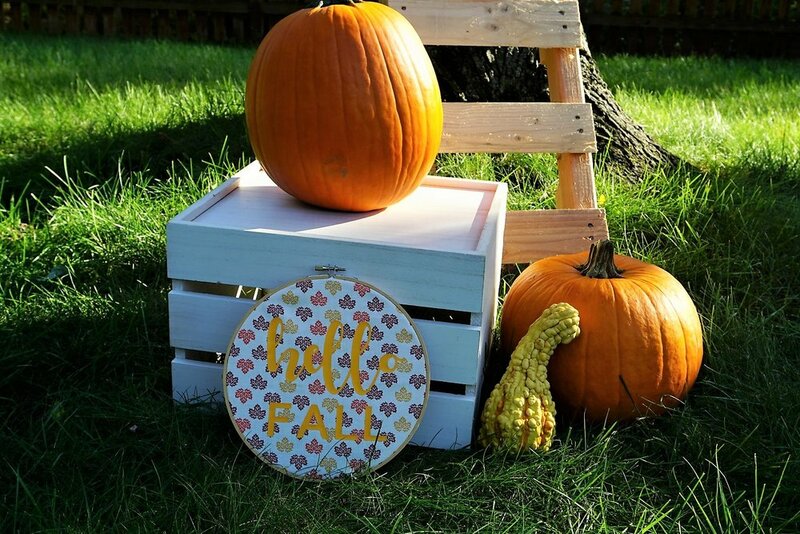 I made a little fall scene with an old pallet, a crate, some pumpkins, and two embroidery hoops with fall sayings! These are easy to make with Cricut iron-on vinyl, some fall-themed fabric, and the hoops. I've been loving embroidery hoops for projects because they are inexpensive and can be used in so many ways! Each guest got a fun PSL-like coffee mug that I picked up at Dollar Tree and tied on this cute tag from Elva M. Design Studio. We sipped spiked apple cider with Captain Morgan and red wine right out of of them all evening! The mug also doubled as a fun favor for everyone to take home at the end of the night. And, don't forget to put out some fun paper straws. I always love Meghan's straw flags and they add a little something fun at any bar or cocktail table! The perfect fall weather led to a nice cool evening that was best spent chatting by the fire. To create some fun seating, I bought hay bales. Local greenhouses often carry these for the Fall, but I was able to get a good deal on them from someone who had farm connections on Facebook Marketplace. Sometimes your neighbors have the best deals! Keep your guests warm by putting some blankets nearby. And, speaking of nearby, I setup the dessert table right by the fire, so people wouldn't forget to make a s'more or have a mini-pumpkin pie! These mini pies are my one of my favorite party secrets. I first discovered them at Walmart for a Kentucky Derby party and have also used them as favors for 4th of July as well! They come in a variety of seasonal options and are only $.50 a piece! To add a little flair to them, tie on some buffalo check ribbon. We had such a fun night celebrating fall and friendship!